People came to White Rock Lake from all throughout the Metroplex to see the lunar eclipse. It was a dark and chilly Sunday night. Minus a few weak flashlights, the cold, concrete overlook was illuminated by the full supermoon. The lake gave off a dim reflection of the moon. 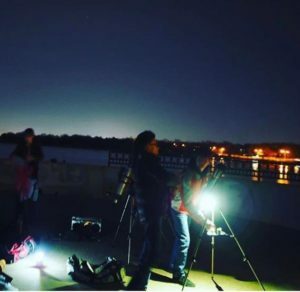 With the help of three Bishop Lynch High School students (Gregory Little, Jackson Reed and Devon West), visitors to White Rock Lake were able to enjoy the “super blood wolf moon” on a new level. The super blood wolf moon is called that for many reasons. According to Fortune.com, it is a supermoon because it will be unusually close to the earth. It is called a wolf moon because it is a full moon in January, and it is called a blood moon due to the lunar eclipse, which gives the moon a blood-red color. After scouting two other places around the White Rock area, Reed and West decided that the overlook just northeast of the spillway would be a perfect area to see the moon. “We wanted to find an overlook with the least light pollution,” according to West. Reed and West finished unpacking their equipment at around 9:15 p.m., which was when the moon was supposed to start dimming. Shortly after, the first group of people came, a family with three young girls. “They arrived shortly after we got there and finished setting up,” according to Reed. Once the group made it to the overlook, Reed and West immediately reached out to them, saying they could use the telescope. “The look on their faces after they saw the moon made me feel like I made someone’s night,” West said. “I was happy we got to give them the experience,” Reed added. Reed decided to invite his friend, Gregory Little, to the scene. According to Reed, “Little came at around 10:15 p.m., just before the next groups started to come.” Little brought his own telescope and set it up next to West’s telescope. “Greg helped by stabilizing the view of the telescope,” West said. Until around 11:30 p.m., the students helped the groups with the equipment. Reed even helped one person with a camera. “I helped focus the lenses of the telescope, adjust its position, and even ended up explaining what made this lunar view so special,” West added. After the long, frigid evening, the students (pictured above) were ready to go home. “My hands were so cold that it hurt to put away the camera,” Reed said. However, the students unanimously agreed the whole experience was worth enduring the cold.